Our parish in the Irinjalakuda diocese wanted to build a home for poor women who are physically and mentally disabled. We were asked to give part of our land for this purpose, and to take over the responsibility for the home. The home accommodates between 30-40 women. “Caritas Christi urget nos.” Motivated by the mission of Father Kentenich and these words for St. Paul, we wanted to help these women from our area to recognise that they are valuable. Motivated by our founder‘s love for people we accepted this task in 2002. Two of our Sisters offer the individual women special love and care so that they feel at home and are cared for. These women are also motivated to work in the house and garden. With the help of the MTA the Sisters try to help the women also spiritually and intellectually. 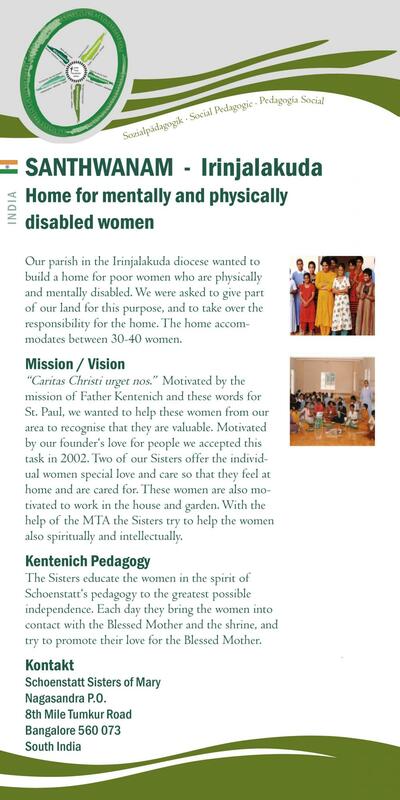 Kentenich Pedagogy The Sisters educate the women in the spirit of Schoenstatt‘s pedagogy to the greatest possible independence. Each day they bring the women into contact with the Blessed Mother and the shrine, and try to promote their love for the Blessed Mother.